Fair Trade Forum – India is celebrating its XV year of establishment in India. 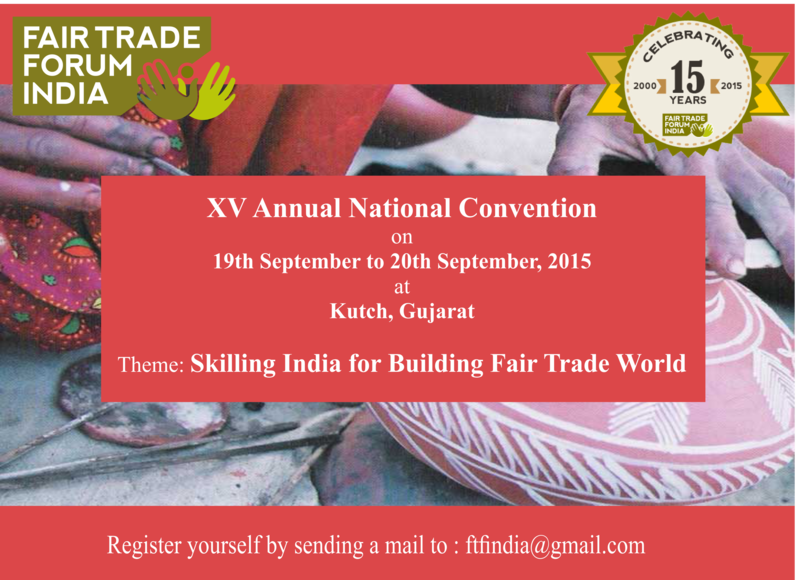 On this memorable day we are extending invite to all of you to participate in XV National Convention and Annual General Meeting 2015 to be held in Kutch, Gujarat from 19th September to 21st September, 2015. National Convention will be an open for all to participate. Be ready to take part in discussing the theme ‘Skilling India for Building Fair Trade World’. ( Royal Orchid Hotels Limited). The arrival and check-in by the participants at Regenta Resort Bhuj is scheduled for 19th afternoon. The registration process on 19th Sept 2015 will start from 2.30 p.m. and the inauguration of the convention will be at 5.00 p.m. The AGM will be on 21st September 2015 (morning). Bhuj is well connected with different parts of the country by Train and Mumbai Bhuj by flights. Also, Ahmadabad – Bhuj – Ahemdabad AC coach buses are also available. Block these dates and make your travel arrangements. Kindly confirm your participation at ftfindia@gmail.com as soon as possible so that we can organise logistics of the conference in advance.